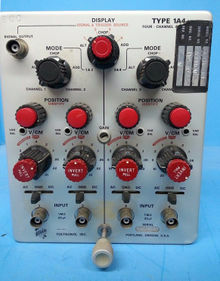 The Tektronix Type 1A4 is a 1-series vertical plug-in for 500-series scopes. It has four input channels and 50 MHz bandwidth. Type 1A4 was introduced in 1967 and lasted until the end of the 500-series scopes line. The four channels are grouped into two groups of two channels. Type 1A4 has a special "trace slaving" mode which, when used in a 547 mainframe, allows channels 1 and 2 to be displayed using the A time base, and channels 3 and 4 to be displayed with the B time base. This allows high-speed and low-speed signals to be displayed together, similar to what a dual-beam scope can do, but without some of the cost and complexity. Like the Type 1A2 and unlike the Type 1A1, the Type 1A4 has a Trigger Output selector that controls which channel provides triggering when the mainframe trigger is in Plug-In mode, for scopes having this feature (544, 546, 547, 549, 556, late 555). Maximum channel sensitivity is 10 mV/div, but a Signal Out jack makes it possible to cascade two channels for approximately 200 μV/div AC with about 20 Hz - 1 MHz bandwidth. The signal path of each channel of the 1A4 is as follows. First the signal passes through the attenuators. Then it is clamped by two diodes and applied to the gate of a JFET source follower. The source of the source follower is the trigger pickoff point. From there the vertical signal path goes through an NPN emitter follower followed by an NPN differential amplifier, at which point the signal becomes differential. Next, the signal passes through an analog multiplexer made with 1N4152 silicon switching diodes. After the multiplexer network, the signal passes through a common base amplifier followed by 6DJ8 tube operating in common grid configuration.